Note : This is the first in this series, pairing Detroit soul maverick Amp Fiddler with reggae heroes Sly and Robbie, with others to come from Ashley Beedle and Horace Andy as well as Mulatu Astatke and The Heliocentrics among others. Strut démarre une nouvelle série exclusive d'albums studios cet Automne, explorant des collaborations aussi alléchantes qu'exceptionnelles. Intitulée Inspiration Information, la série rassemble des artistes et producteurs contemporains et leurs héros musicaux ; des artistes qui ont directement inspirés leur propre carrière. Ensuite ils ferment les portes du studio pendant 5 jours d'écriture et d'enregistrement intensif. La collaboration requiert une direction artistique ouverte voulue focalisée sur la spontanéité et une véritable fusion des styles plus que sur des restrictions marketing liées à la production d'un album d'artiste normale. Chaque album peut prendre la forme que l'artiste choisit, allant d'une structure de morceau basique de 3 minutes à des morceaux de forme libres plus étendues. La série se veut gardienne d'un son et d'un style frais et espère représenter un instantané du son de chaque artiste au moment de l'enregistrement. Une fois que l'album est mixé, le planning promotionnel débute immédiatement, avec la plupart des albums sortant moins de 3 mois après les sessions. La série démarre sur les chapeaux de roues avec le combat musical catégorie poids lourds entre le rebelle Soul de Detroit, Amp Fiddler et les légendes Reggae, Sly Dunbar & Robbie Shakespeare. This Autumn brings the launch of a priority new series on Strut as the label takes a break from its schedule of funky compilations and moves into new studio recordings for the first time. Entitled Inspiration Information, the series brings together current artists and producers with their musical heroes for a mouth-watering one-off collaboration. With each album centred around an intensive five-day writing and recording session, the emphasis is on spontaneity, musicianship and an open A&R brief. The series kicks off with Detroit soul maverick Amp Fiddler in a head-to-head with reggae legends, Sly Dunbar & Robbie Shakespeare. "This is monumental for me," says Amp. "I discovered Sly & Robbie through their Compass Point productions with Wally Badarou, all the Grace Jones records, 'Boops' too. I loved the way they experimented with a more ambient direction." "Our manager Guillaume Bougard, "The General", told us about Amp," says Robbie. "We heard that he used to be part of the Funkadelic set-up." "We were always right into the Parlia-Funkadelic sound," recalls Sly. "Their brand of funk was so different. I loved it from their first record. Me and Bootsy Collins are good friends - he played on one of our albums - and I always loved Motown too, ever since I was a kid. That all brought us closer to Amp and the musical groove just stuck. We hit it off from the first session." Arriving at Anchor Studios in Kingston, Jamaica, armed only with a handful of acoustic vocal ideas, Amp and the Riddim Twins recorded the album in just three days during June with overdubs laid down a week later in Detroit. "We work fast," says Robbie. "Time is money!" The result is a confident, laid back set that brings a whole new twist to Amp's trademark vocal style: Sly builds innovative digital and live rhythms, Robbie underpins the tracks with solid bass foundations and original generation guests "Sticky" Thompson (percussion) and Dalton Browne (guitar) add plenty of colour. Back in Detroit, Amp knitted together the finishing touches, adding extra keys and backing vocals. The tracks are never predictable, at times echoing Sly & Robbie's '80s days with Island Records at Compass Point studios, at others structured around more mood-based keyboard pads and new patterns re-inventing the established dancehall template. "It's been amazing - the level of musicianship is sky high," explains Amp. "Sly & Robbie work so well together - everything has happened really smoothly." 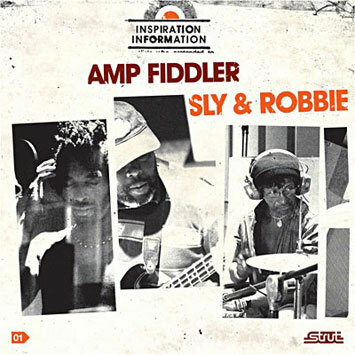 Within the sessions, the trio honed both new compositions and covers, including a pertinent re-work of a George Clinton-era classic, 'Paint The White House Black' re-titled by Sly as 'Black House'. They also revisited select tracks from Amp's 'Waltz Of A Ghetto Fly' album from 2004, with Amp favourites like 'I Believe In You' re-worked over a lilting reggae base. The album was mixed in London by another original Island Records studio regular, Godwin Logie, complete with extra dub versions of selected tracks worked live off the desk. All album design inspired by some of the striking photography-led sleeves of the '70s on the Prestige and Blue Thumb labels. This album features images by leading US photographer Wonder Knack and is packaged in a deluxe digipak with a CD booklet documenting the sessions.